Good morning polished world! Still kind of crazy busy over here at The Little Canvas, so I again apologize for not responding to comments! I am reading each one as they come in and they're putting smiles on my face, so please keep them coming! I swear this weekend (or even tomorrow) I'm going to play catch up!!!! 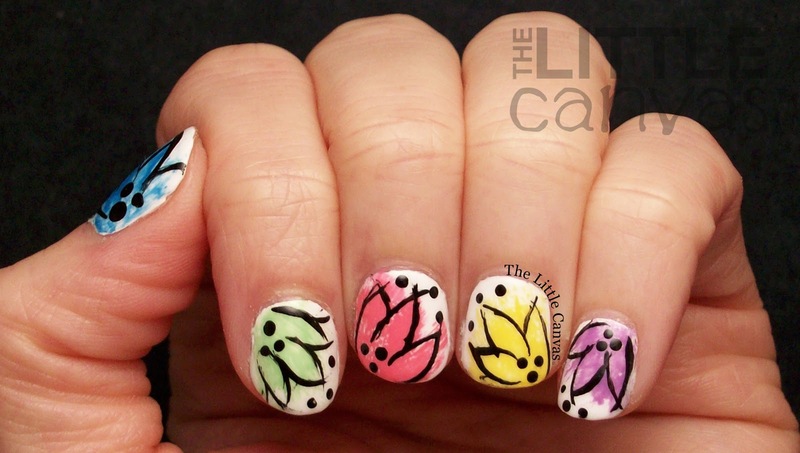 Today I'm digging into The Little Canvas vault and posting a manicure I did months ago. I have wanted to share it forever, but it kept getting delayed due to new manicures I wanted to share. Now that I've done a few different splash flower designs and I have another one coming up, I figured I should probably share my first splash flower manicure. 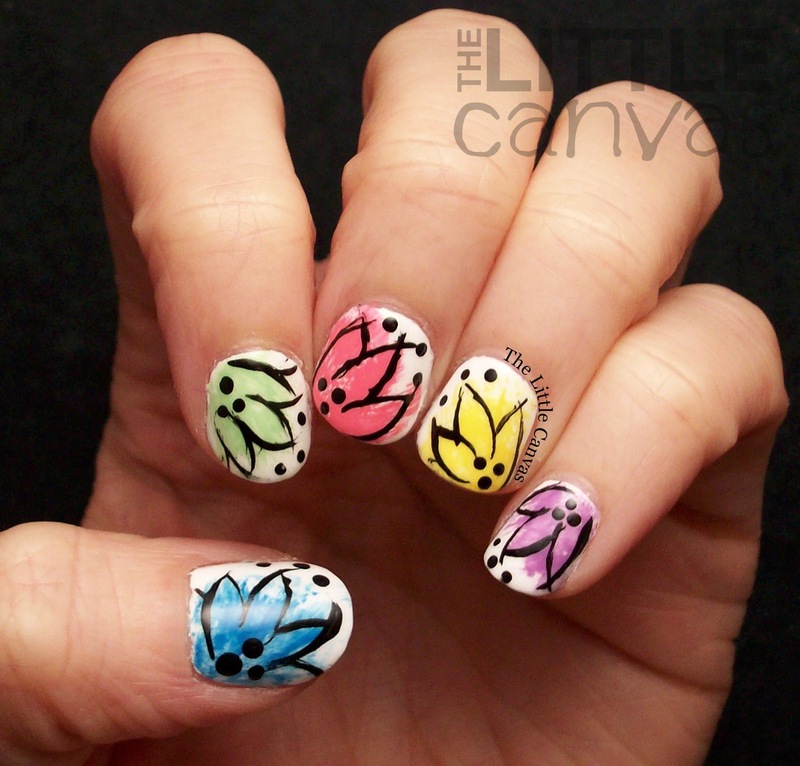 This manicure was inspired after seeing this splash flower tutorial by The Lacquerologist. Emily created such a cute floral look, and as soon as I saw it, I knew I wanted to re-create it. I decided to do a multi color skittle design because why not? Around the same time I did mine, Amy from PolishEtc and mcpolish on Instagram did multi color skittle one also. I really liked her's so head on over to her Instagram and search through while looking at all her other awesome manicures! Let's take a look! Goodness my nails were shorter. I've been trying to grow them out recently, and now I can really see the difference looking back at this manicure! That moment where you're super to find you were proactive and wrote the list of colors used back when you painted the nails so now you don't have to dig through your very full memory bank and remember what colors. I'm so proud of myself since I truly rarely do that with my posts. Well, I take that back, when I use more than 5 polishes (especially when it comes to skittles) I try to write them down. The two color manicures I'm good at remembering. Anywho, I got the look by following Emily's tutorial. I started off with a base coat of white polish. When my base was dried, I grabbed the color I wanted and brushed off as much of polish as possible and then did a few brush strokes on my nail in the shape of the petals. It is the same technique you would use to create Chalkboard Nail's grunge manicure. 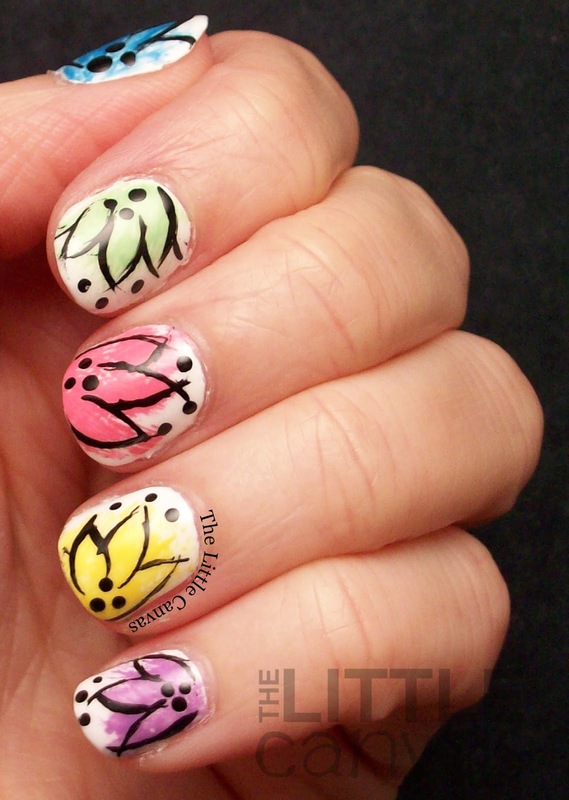 When the colors were dried, I grabbed my Orly striper and created the petal outlines. 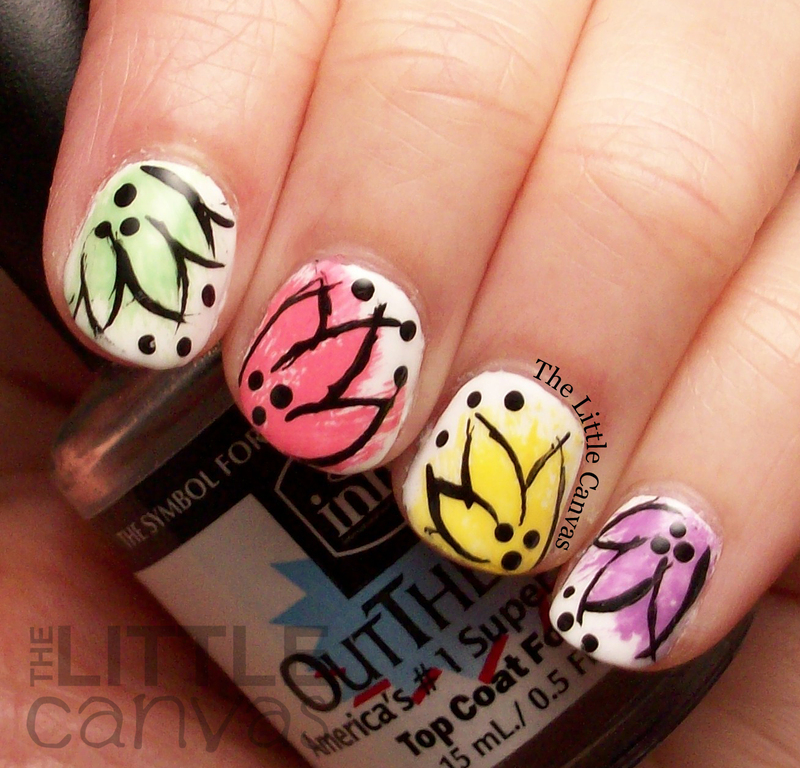 At the time I did these, I wasn't really confident with my striping skills, but it was really okay! The petals aren't supposed to be perfect and the rigidness gives the floral a much more unique and abstract look. What do you think? Liking the skittle splash flowers? Have you tried this design? I think I have one or two more splash flower manicures coming up soon, so I hope you aren't sick of the look! I honestly don't think that it can ever get old. Back to my busy life! Can't wait to catch up on all my commenting!